3D Systems brings its legendary reliability and repeatability to production-level Direct Metal Printing (DMP) with the ProX™ 300 3D printer. The ProX 300 3D printer makes additive manufacturing an industrial option for the production of metal parts. The ProX 300 is the largest in our DMP range, offering a build volume of 50 x 250 x 300 mm. It features an automated material loading and recycling system, and supports materials including Maraging 1.2709, Stainless 17-4PH, Ti6Al4V, AlSi12. 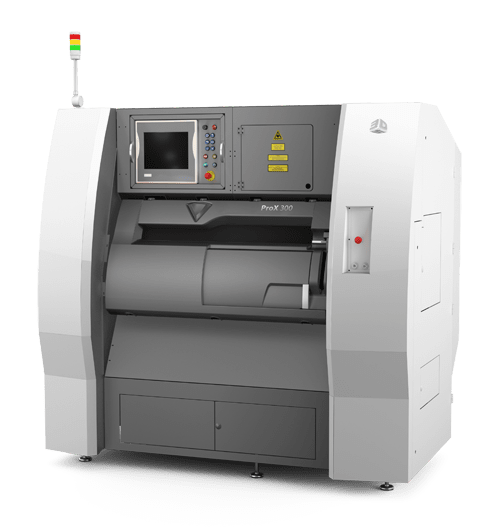 The ProX line of DMP 3D printers are providing seamless and intuitive metal 3D printing in a variety of industries: custom dental prostheses, orthopaedic implants, tire moulds, watch manufacturing, aerospace parts and more. In addition, these systems are wisely used for direct creation of conformal tooling, tooling insert and blow mould production.